This turmeric chicken dish was one of the first recipes I made when our new cooker was installed. I was so used to our almost fifty-year-old gas hob (recently condemned by the gas man) that I’d long adapted my cooking to its idiosyncracies. What a treat to cook on a hob that is actually level! To reduce a sauce in five minutes instead of fifteen! This dish would be delicious whatever you cook it on. I served it with steamed couscous tossed with chopped herbs and feta cheese. The original recipe comes from the Five and Spice website, who adapted it from The New Persian Kitchen by Louisa Shafia. So I’ll cite them both – to give credit where credit is due. In a small bowl, combine the turmeric, pepper and salt. Rub the mixture into the chicken pieces. In a large skillet or heavy pan, heat the oil over medium-high heat. Add the chicken skin side down and cook for five minutes, until the skin is browned. Flip the chicken and brown the other side. Stir in the onion and cook for a few minutes. Add the garlic and water, bring to a boil, then reduce to a simmer. Cover and cook for 25 minutes, until done. Transfer the chicken pieces to a plate, turn up the heat and reduce the sauce. Pour the sauce over the chicken and sprinkle with line. 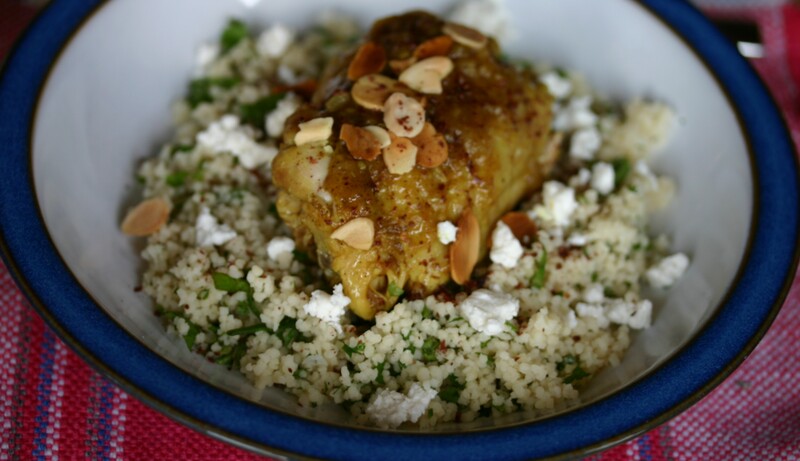 Garnish with flaked almonds and sumac and serve with steamed couscous or rice.